Now this is what a universal set should be. Set 8082 was released in 1993 and contained quite a lot of firsts. There are 4 models, all of which are quite unique. 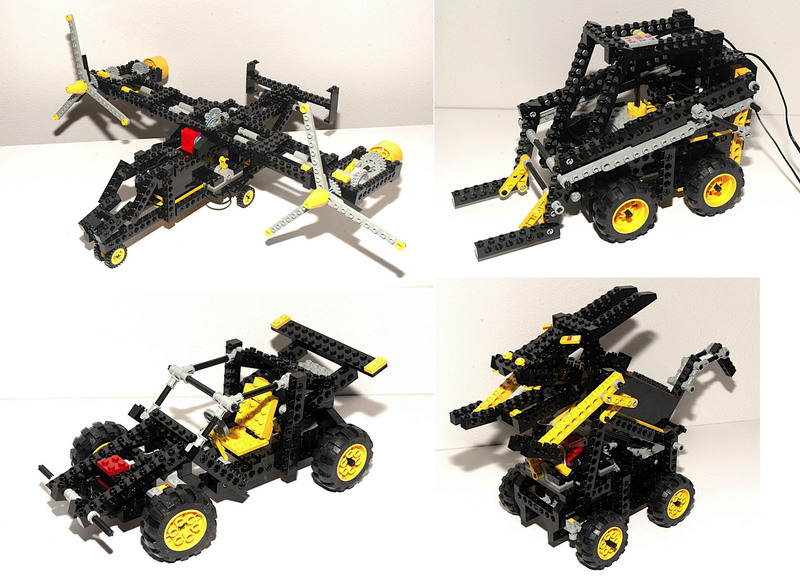 A couple of them have features which are unprecedented in Technic and would be good enough to be a standalone set. I highly recommend picking one of these sets up. 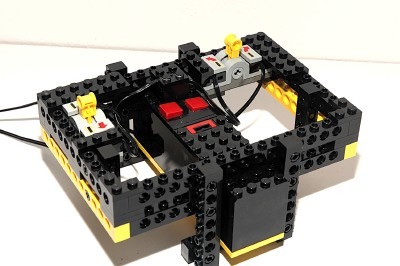 The remote control car has a separate wired controller which can both drive and steer the car. 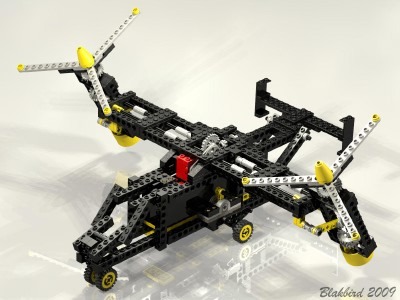 The airplane features counter-rotating propellers and pivoting nacelles. 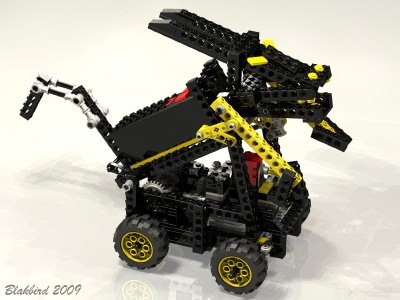 The cat/rabbit thing may not look like much, but it features a unique mechanical and electrical feedback system which exists only in this model. It is worthy of note on technical merits without a doubt. The forklift is marvelous and manages to combine 3 complex functions with a single driving motor, all controlled remotely. This is the first set to contain the new pole reversers. There are two of them here, and they are used predominantly as a means of manual control of multiple motors. In one model, they are actually driven by the mechanisms in the model. 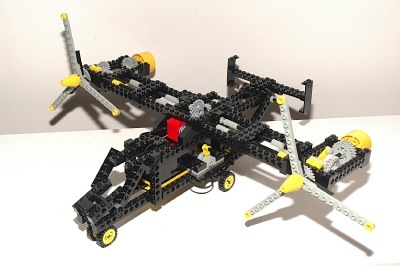 This set contains 2 motors, one of which is the new micro motor. It may seem small, but this set shows how remarkably useful it can be by demonstrating several possibilities. The long wires are kept from tangle using a set of flexible helical rubber keepers which exist in only two sets. I find the Forklift the most interesting, and it is the model I chose to keep assembled for my display of this set. This car was the first Technic set which featured any kind of remote control other than the simple on/off in 8064. The remote is a hand held device containing the battery box and a pair of pole reversers. 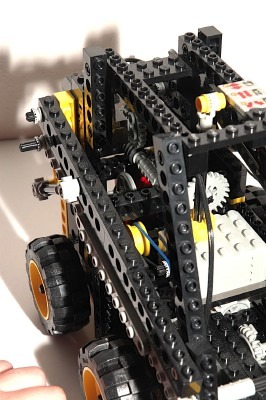 The left hand switch moves forward and back and controls the drive wheels of the model. 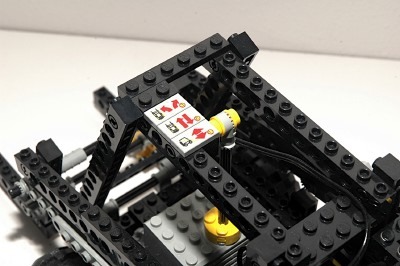 The right hand switch moves side to side and controls the steering of the model. A pair of wires, one for each motor, run from the controller to the model. The wires are quite long and allow you to stand and drive the model on the floor while following it. For reasons outlined below, this is not a very controllable R/C car, but it was an excellent first model and would be improved in various ways in the future. Click to download the LDraw file of this model. 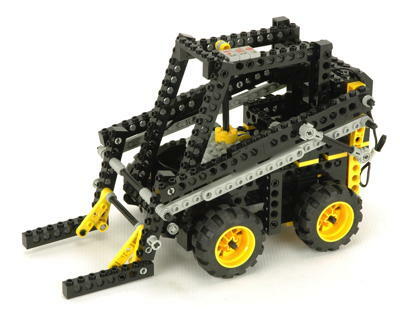 The front wheels can be steered using the remote. 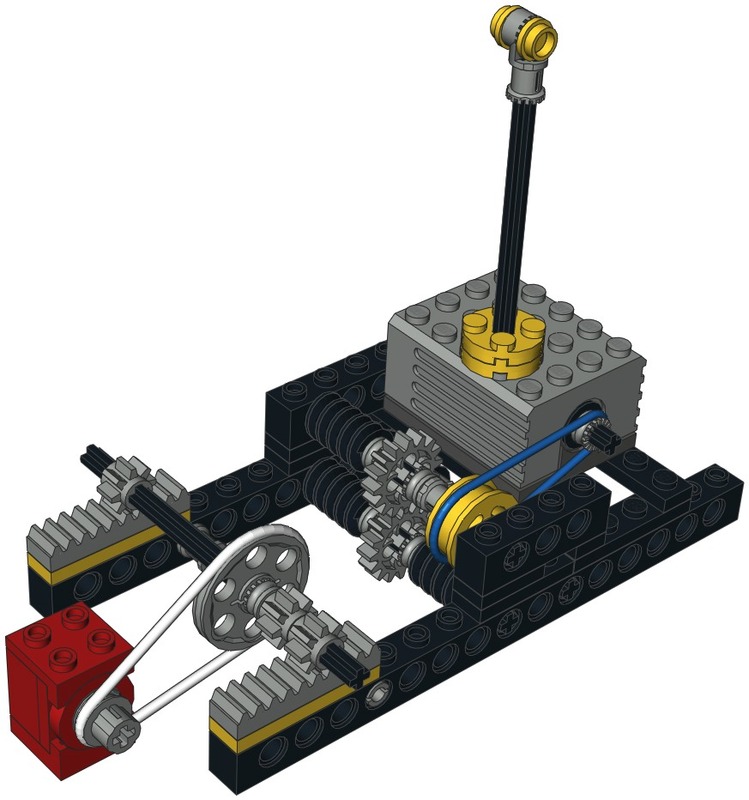 A micro motor drives an axle through a belt and a pair of pulleys. 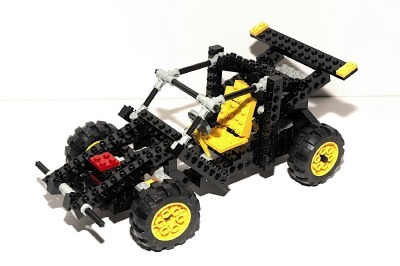 The axle drives a pinion which drives the steering rack. A u-joint connects the driver's wheel so it follows along as the wheels are turned. The use of a belt allows the steering to contact its stop without stalling the motor. The very slow rotation speed of the micro motors allows for fairly precise steering control. However, there is no servo so there is no position feedback. The steering is also not spring loaded to center. This means that at the end of a turn you have to manually recenter the wheels by reversing the steering. This makes driving quite difficult and going straight almost impossible. Click for an animation of the steering in motion. 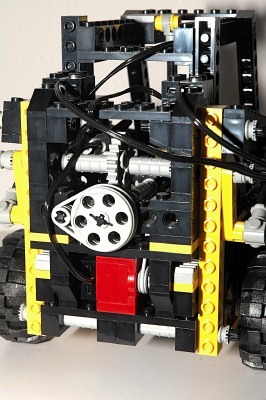 The rear axle is driven by a 9V motor through a belt and pulleys. Subsequent to the belt is a set of 8 and 24 tooth spur gears. Finally, a 14 tooth bevel mates with the 28 tooth ring gear of the differential. 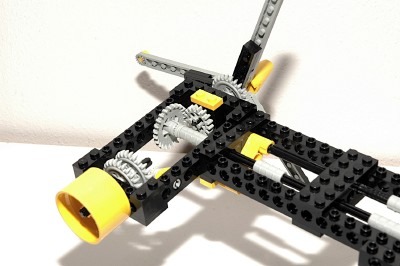 This results in a gear ratio of roughly 18:1 between the motor and the wheels. 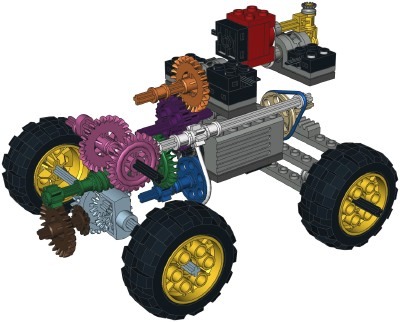 The rear axle uses a differential gear to allow smooth turns since the wheels can turn at different rates. It incorporates a built-in 28 tooth ring gear which can work either as a bevel or a spur, similar to the 24 tooth crown gear. It is made to house 3 of the 14 tooth bevel gears. 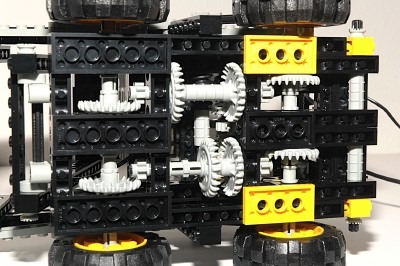 One is on each axle, and one planet gear in the middle allows the axles to turn at different rates. Click for an animation of the vehicle in motion. This very boxy looking airplane seems to clearly represent a Bell/Boeing V-22 Osprey. Considering that when this model was in development the V-22 had only existed for a year or two, this model is pretty topical and the details are even fairly scale. The V-22 can sustain fixed wing forward flight like an airplane, but can also rotate the huge 3-blade props vertical and hover like a helicopter. The battery box is housed within the fuselage. There is a pole reverser on either side of the landing gear fairing which controls the motor functions. The propellers are housed at the wingtips in huge nacelles. Each engine has a faux turbine engine at the rear which does not actually move. A 9V motor in the fuselage drives a pair of pulleys through a belt, reducing the speed 3:1. A second set of pulleys have equal size so result in no further adjustment. An 8 tooth pinion next mates with a perpendicular 24 tooth crown, further reducing the speed. This crown drives an axle which runs the full span of the wing into a crown gear at either end. Because the crown gears both face inboard, the props rotate opposite directions. This is as it must be on the real plane or the torque of the props would cause the entire aircraft to yaw continuously. On the real plane directional control at low speed can be controlled by adjusting the relative shaft speeds of the two props. On the model the props are hard geared together, so no relative motion is possible. It may look like the animation is bouncing, but I'm sure that is a result of the massive turbulence spawned by the props rather than due to any incompetence on the part of the animator. Click for an animation of the propellors in motion. The engine nacelles can be rotated longitudinally through an angle of about 90 degrees, from forward to up. This motion is powered by a micro motor in the fuselage driving a pair of pulleys through a belt. The linkage and axles are not very stiff which tends to result in a lot of oscillation (bouncing) if the nacelles are rotated while the props are turning. Note that the rotation of the nacelles must necessarily be around the axis of the propeller drive axle. This means that the pivot mechanism was forced to be offset from this axis. As a secondary effect, this means that the props turn slightly as the nacelles pivot. You can see this in the animation. Click for an animation of the nacelles pivoting. * I apologize who anyone who is not a fan of Monty Python, since you probably have no idea what I am talking about. You don't know what you are missing. 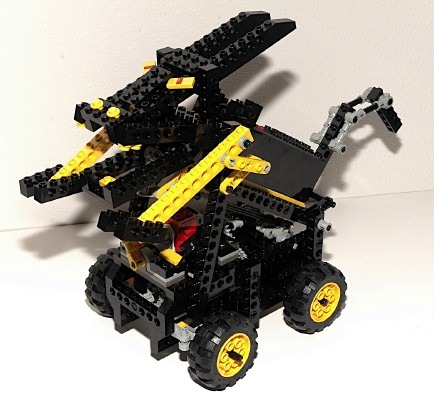 This robotic cat/rabbit thing is ugly which kept me from building it for many years. However, the internal mechanical workings are fascinating. The primary motive power comes from the large 9V motor. This motor is also coupled to a gear system which rotates a pole reverser. 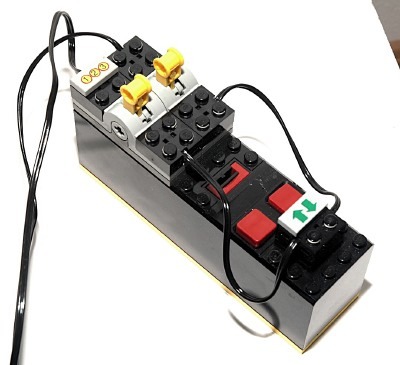 This pole reverser controls the voltage polarity to the micro motor. The micro motor is attached to another pole reverser and serves only the reverse the main motor. This results in a feedback loop which alternates the various functions which are explained in detail below. The animation really does not do this justice, but it gives you the general idea. Also note that animation shows the model moving significantly faster than it really does. Click for an animation of the feedback loop in motion. The main 9Vmotor drives a host of functions in parallel, so I had to use lots of colors in the computer image to help make sense of it all. There are 4 total parallel driven functions. Let's start at the motor output shaft. 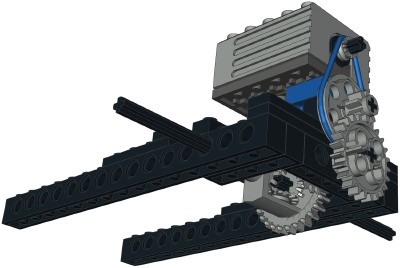 This drives the blue pulley through a belt which allows the motor to slip if the resistive torque becomes too high. The blue pinion gear drives the green crown. At this point the functions split in to parallel paths, so I'll stick with the path to the drive wheels. The green pinion gear mates with the brown crown. The brown bevel gear drives the ring gear of the differential. The diff incorporates a built-in 28 tooth ring gear which can work either as a bevel or a spur, similar to the 24 tooth crown gear. It is made to house 3 of the 14 tooth bevel gears. 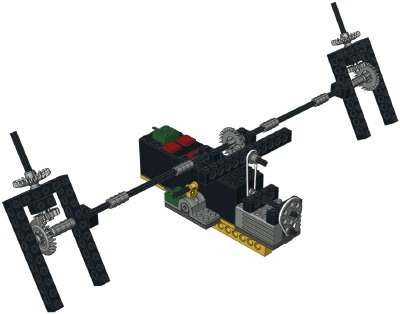 One is on each axle, and one planet gear in the middle allows the axles to turn at different rates. 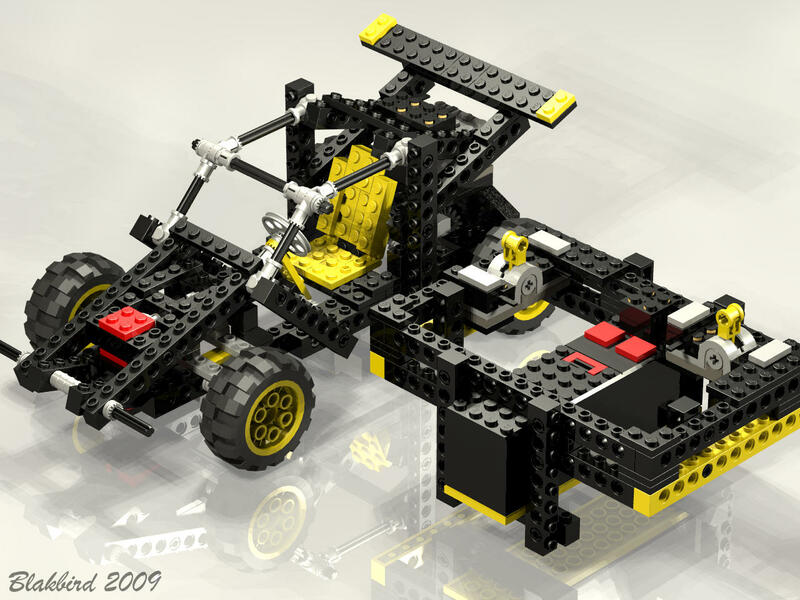 The final gear ratio between the motor and the rear wheels is about 54:1. The first parallel path splits off of the green axle at the worm gear which drives the pink 24 tooth crown. At second pink crown mates with a white 8 tooth pinion. The white pulley at the far end of this axle drives the tan pulley through a belt. The tan pinion drives the steering rack. 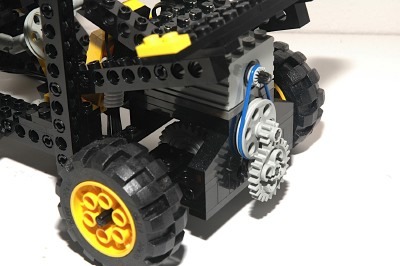 The belt allows the axle to slip once the steering is bottomed. The steering mechanism itself uses control arms and toothed links. Moving back to the white axle we can see the next parallel path. The white pinion drives the purple spur gear. A purple pinion drives the orange crown. The orange axle then turns the center of the first pole reverser. This pole reverser controls power to the red micro motor. The orange axle rotates continuously (+/-). The gear reduction at the pole reverser is extreme: (3/1) * (24/8) * (24/1) * (8/24) * (24/8) * (24/8) = 648:1. The final path is controlled by the end of the pink axle where you can see a crankshaft element. The second computer image shows the long black axle which connects to this crank, producing an oscillating motion. 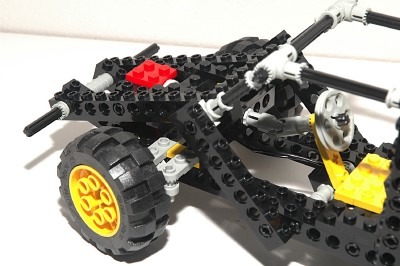 The black axle drives the yellow crank. Rotation of the crank axle waves the arms up and down through the yellow toothed links. The yellow crank is also connected the lower jaw which opens and closes at the rear pivot axle. Eveery time the pole reverser rotates 90 degrees, the micro motor is activated which then reverses the polarity of the main motor. The result of this feedback is that the model first drives forward while turning alternately left and right, all the while waving the arms and opening the mouth. Then the main motor reverses and the model drives backward. This continues until the batteries run out. Click for an animation of the arms and face in motion. Click for an animation of the drive system in motion. This skid steer forklift is a marvel of mechanical engineering. The designer should be proud. The model drives forward and backward, turns left and right, and raises and lowers the forks. All of this is accomplished with one main drive motor. The micro motor is used as a sort of mechanical transmission, shifting between the primary functions. The model is controlled from a remote controller built around a 9V battery box. There are 2 pole reversers housed on the front which control the varoius functions of the model through a pair of wires running into the top/rear of the forklift. Both motors can be operated simultaneously. The multi-function use of this set comes from a translating rack transmission. The red micro motor moves everything you see in the computer image. A pulley drives an axle with a pair of pinion gears at the ends. The pinions drive a pair of racks which translate the whole primary motor assembly. In the other image you can see the "indicator" which shows the operator which gear they are in. The indicator aligns with one of the 3 different tiles at each function. The main motor drives a pulley wheel through a belt. 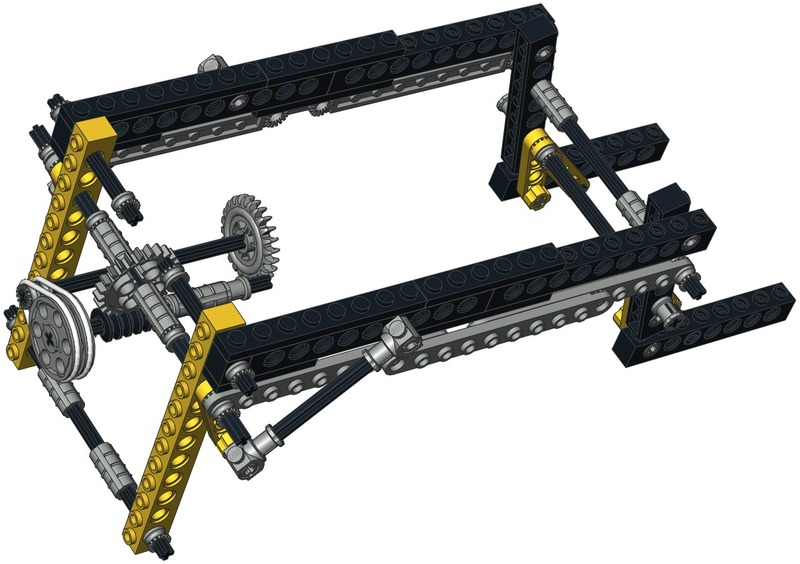 The belt axle drives a worm gear as well as a pair of 16 tooth spur gears. The second spur axle drives another pair of worms. 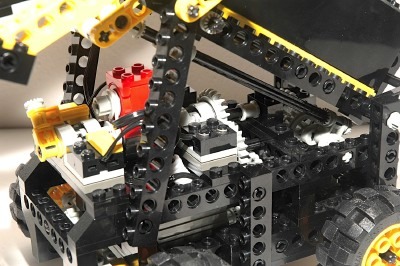 All 3 of these worms are therefore rotating whenever the main motor is powered. 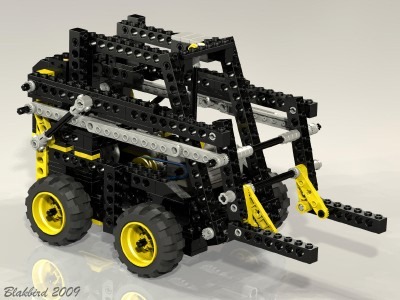 Translation of the rack system causes the worm gears to mesh with various different other gear systems, thus controlling multiple operating functions of the vehicle. Although difficult to see in the image, there is another axle behind the one with two worm gears. This has a worm gear on only one side as is not connected to anything else. This may at first seem useless, but the point is revealed further down. Click for an animation of the function shifter in motion. The skid steer locomotion system is 4 wheel drive. The blue gears drive the left side and the green gears drive the right side. You can see that one pair of blue and green crown gears are aligned along the length of the vehicle. 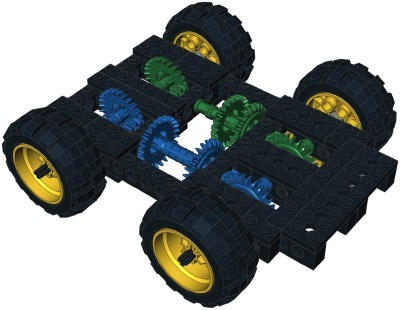 When both driven worm gears mate with these, the entire vehicle moves forward or backward. The second pair of blue and green crown gears are not aligned. The green gear halfway along the length of the vehicle ends up mating with one of the driven worm gears, so the right wheels still turn. The second blue gear mates with the mystery worm gear we heard about earlier. Since worm gears cannot be backdriven, this idler axle effectively locks the wheels on the left side. This allows skid steering of the vehicle. 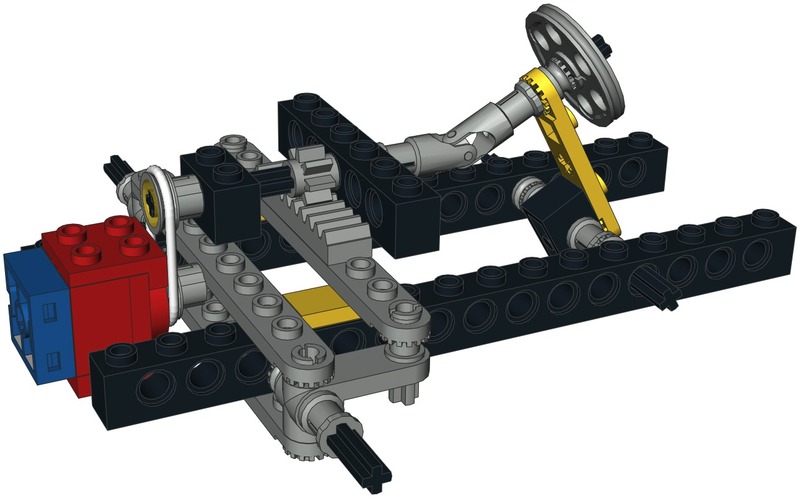 Click for an animation of the model steering. Click for an animation of the model in motion. The third function is lifting of the forks. 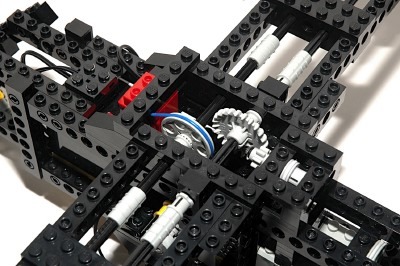 When the drive system is translated all the way into the aft position, the upper driven worm gear drives the 24 tooth crown in the computer image. 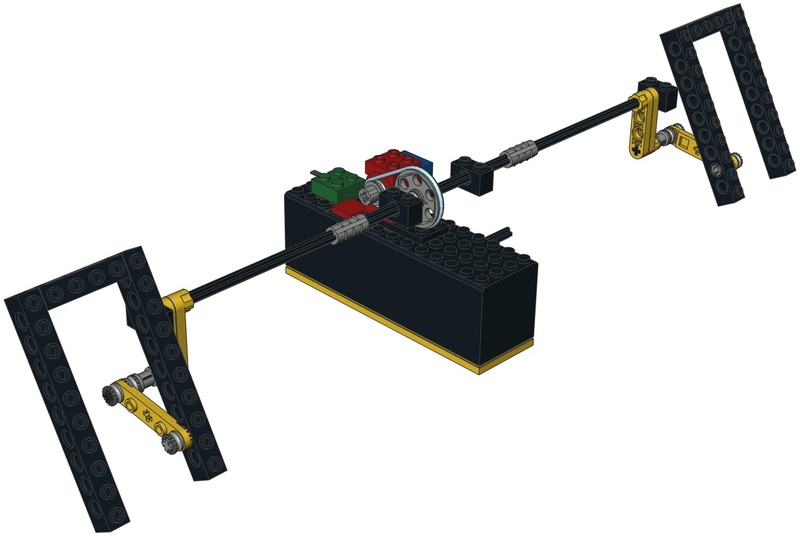 The next axle uses a pair of belts and pulleys to transmit torque. The axle driven the large pulleys turns another worm gear which drives a 24 tooth spur gear. This final gear turns an axle which pivots a crank arm of the main fork arms. The fork mechanism is a 4-bar linkage which remains parallel to the ground. Because there are two stages of worm gearing in series, this lift has a massive gear reduction of about 3500:1! This, along with the rear pivot point, gives the forks a lot of lifting power and no chance whatever of backdriving the motor. The forks do not tilt. Click for an animation of the forks lifting.